For many people, heart disease is preventable. Learn about how your heart works and how exercise and diet can help you to manage or prevent heart disease for a better quality of life. Heart disease affects millions of Americans. Of combined heart diseases, coronary artery disease affects more nearly 380,000 people in the United States each year. Roughly 720,000 Americans have a heart attack each year. 28% of these Americans who have a heart attack each year represent people who have already had 1 or more heart attacks. Do you know how blood circulates throughout your body? Your heart’s main function is to pump blood through your body to provide oxygen rich blood required for you to live. The heart is a muscle with 2 sides, separated by 4 blood-filled chambers, 2 chambers per side. It is helpful to think of the heart as a container divided by 2 de-oxygenated compartments stacked on top of each other to the left, and 2 oxygenated compartments stacked on top of each other to the right. The two top compartments are the left and right atrium. The two lower compartments are the left and right ventricle. Remember, right side, right atrium and right ventricle are de-oxygenated. The left side, left atrium and left ventricle are oxygenated. These 4 compartments work together to make the heart pump blood. Blood from the body flows to the superior vena cava and inferior vena cava, then to the right atrium through the tricuspid valve to the right ventricle through the pulmonary valve to the pulmonary artery to the lungs. 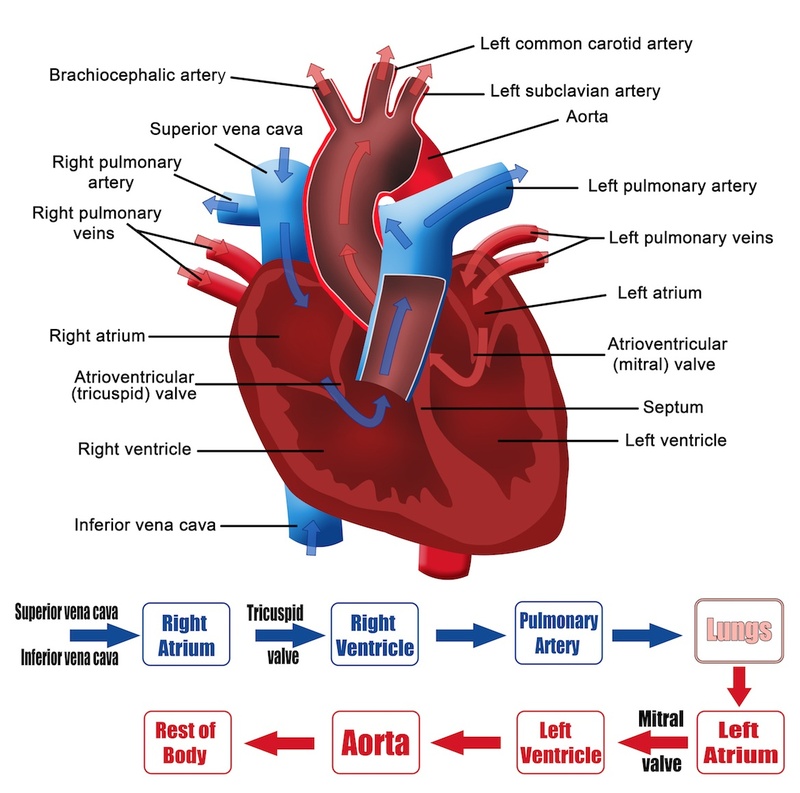 Blood then picks up oxygen in the lungs, and then flows from the lungs to the pulmonary veins to the left atrium through the mitral valve to the left ventricle through the aortic valve to the aorta to the body. To better illustrate how blood flows in, through, and out of the chambers of the heart to other parts of the body simply click on the illustration box below. How does heart disease damage the heart? Perhaps now you have a better understanding of how your blood flows throughout your body. Blood flow is vital to your health. Heart disease is characterized and defined as a structural or functional defect of your heart, or of the blood vessels supplying your heart, that impairs its healthy operation. Fatty deposits made inside your arteries, called plaque, build up causing restriction of healthy blood flow and increases your risk for heart attack or stroke. As plaque occupies more space within your arteries, which carry blood away from the heart, it can actually block the outward flow of blood from your heart. Plaque can build inside all of the blood vessels in your body. This is how heart disease progresses. As I described earlier, the ability of your blood to carry oxygen and vital chemicals from your lungs to your heart is vital to your heart health. When this build-up of plaque restricts blood flow, it is actually restricting oxygen as well. As a result your heart cannot operate or function as it normally does. Continued blockage in blood vessels restricts blood and oxygen to the point that not only does your heart not work well, but the heart muscle becomes damaged or begins to die. This condition leads to clotting of blood supply to your heart resulting in a heart attack or myocardial infarction. Heart disease affects more than your heart. Continuing in this line of blood vessel blockage, if this plaque builds-up to present an obstruction in a vessel that carry blood to your brain, you can suffer a stroke. This type of stroke is called an ischemic stroke and accounts for 87% of all stroke cases. Blood vessels can become weakened and brittle. As the blockage within the vessel increases blood pressure or hypertension the blood vessel can rupture. The result of this can be a hemorrhagic stroke. The result of a stroke is brain damage or even death. How to prevent heart disease for apparently healthy people? Prevention of heart disease is the best strategy for quality of life. As I mentioned earlier, if you eat well and exercise, you can prevent many illnesses, disorders, and diseases, including heart disease. If you are physically active, within a proper in tensity level, throughout your life, you will improve your health and quality of life many times over as compared to people that are not physically active. Specifically related to heart disease, the functions of your heart (if apparently healthy) will continue to work well, blood will flow throughout your circulatory system without fail, and your cardiovascular health will continue to improve if you exercise regularly and eat fresh, nutritious and well balanced, meals. The exercise guidelines for apparently healthy adults suggest that a minimum of 30 minutes per day of weight-bearing, multi-joint, physical activity is necessary to maintain ideal health. The recommendations for exercise and physical activity for children begin at 60 minutes per day, seven days a week, to maintain ideal physical fitness and health. Exercises including movements that mimic activities of daily living like lifting your arms over-head, pushing and pulling, walking, running, sitting and standing (squatting). Transitional movements, considered functional training movements; these movements are beneficial because these movements are designed and arranged by movement patterns that specifically focus on using many joints and muscles together to accomplish movement in all three planes of motion. Sagittal, transverse, and frontal planes of motion are zones, or areas, natural to human movement and therefor necessary in practice while exercising. You can find much more information about exercise physiology and principles of exercise throughout our website. Simply use the search box by entering a phrase or question for relevant answers to your needs or questions. The difference between exercise and physical activity depends on your physical limitations, if any, and your desired fitness outcome. We offer a great deal of information about types of exercise, exercise duration, frequency, and intensity recommendations for people of all fitness levels based on scientific principles and guidelines established by leading exercise physiologists, educators, and researchers. Most exercise recommendations begin with in-depth evaluation of your current health and fitness status. You can find calculators for quality of life, current fitness level, BMI, calories burned during exercise, and body fat percentage, among others, that can help you understand more about your current health and fitness level. The calculators have been developed using the latest data and science-based mathematical formulas that consider your personal health markers and data to help you to plan safe, progressive, exercise and physical activity to maintain and improve your health. Prevention is key. Exercise that is designed to help you prevent risk factors for disease should be the foundation of your exercise plan. How to manage heart disease by taking medications, eating well, and exercising daily? Obviously many of these conditions can be controlled or even prevented. Heart disease is preventable for most people. That said, it is very important that if you have heart disease you must follow your doctor’s recommendations and take all, if any, medications you are prescribed. Along with prescribed medications, limiting the leading behaviors that elevate your risk for heart diseases begin with evaluation of your diet, lifestyle habits, and daily level of physical activity. If you regularly drink alcohol, eat foods high in saturated fats, sodium, and low in fiber, you can increase your risk for heart disease. The best medicine for health is healthy food. Whole foods that contain healthy fats, fiber, water, vitamins, minerals, and antioxidants can keep you healthy and help you to avoid higher risks for heart disease. For detailed information on healthy eating and foods that contain the nutrients I’ve just described, please vista our nutrition section or simply use the search box and enter a phrase or question about nutrition. Exercise is essential. Not only is exercise essential for managing or preventing heart disease but exercise is essential for healthy living on all levels. My job is to illustrate what happens when you do not exercise or eat well, outline many of implications as defined by known science, and show you how exercise, and what type of exercise, is moist beneficial for you. If you do have heart disease, or you have experienced a heart attack or stroke, you must proceed with exercise under the supervision of an exercise professional following your doctor’s guidelines and instructions. Essentially, if you follow your doctors recommendations, including taking your schedule of medications, regular exercise within your limitations, practiced daily, exercise can save your life. However, there are types of exercise that you may want to avoid if you are managing heart disease, you have had a heart attack or stroke, or other contraindications to exercise exist. These types of exercise include exercises that can increase your blood pressure to an unhealthy range or cause your to strain beyond recommended ranges. Your doctor will explain all of this to you in detail. Of course, you will make progress and be able to accomplish activities of daily living with greater ease if you do exercise. 1. “America’s Heart Disease Burden.” Centers for Disease Control and Prevention. National Center for Chronic Disease Prevention and Health Promotion, Division for Heart Disease and Stroke Prevention, 26 Sept. 2014. Web. 4 Oct. 2014. Blaha M., Dai S., Ford E., Fox C., Franco S., Fullerton H., Gillespie C., Hailpern S., Heit J., Howard V., Huffman M., Judd S., Kissela B., Kittner S., Lackland D., Lichtman J., Lisabeth L., Mackey R., Magid D., Marcus G., Marelli A., Matchar D., McGuire D., Mohler III E., Moy C., Mussolino M., Neumar R., Nichol G., Pandey D., Paynter N., Reeves M., Sorlie P., Stein J., Towfighi A., Turan T., Virani S., Wong N., Woo D., Turner M. “Heart Disease and Stroke Statistics−2014 Update: A Report From the American Heart Association.” American Heart Association Journals. American Heart Association, 18 Dec. 2013. Web. 4 Oct. 2014. 3. Bianco, MD, C. “How Your Heart Works.” How Stuff Works. HowStuffWorks, a Division of InfoSpace LLC, 20 July 2010. Web. 4 Oct. 2014. 4. “Types of Stroke.” American Stroke Association. American Heart Association, Inc., 23 Oct. 2012. Web. 4 Oct. 2014. 5. “People under 40 Are Five times More Likely to Have a Heart Attack If They Smoke, a Study Shows.” British Broadcasting Corporation. The British Broadcasting Corporation, British Government, 24 Aug. 2004. Web. 4 Oct. 2014. 6. “America’s Cholesterol Burden.” Centers for Disease Control and Prevention. National Center for Chronic Disease Prevention and Health Promotion, Division for Heart Disease and Stroke Prevention, 16 Oct. 2012. Web. 4 Oct. 2014. 7. “Heart Disease Statistics.” Cardio Smart. American College of Cardiology, 1 Oct. 2013. Web. 4 Oct. 2014. 5 times higher rate for developing heart disease. 2 times higher rate for developing heart disease. 30 percent greater rate for developing heart disease. 36 percent greater rate for developing heart disease. 1.8 times higher rate for developing heart disease. Are you a interested in heart health? Are you interested in learning about the benefits of exercise for heart health? Consider hiring a personal trainer. If so, please visit our homepage and use the “find an instructor by city” search bar.